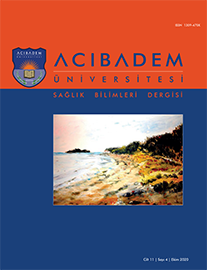 2TC Sağlık Bakanlığı Dr. Sadi Konuk Eğitim ve Araştırma Hastanesi, Kalite Birimi, İstanbul, Türkiye DOI : 10.31067/0.2018.65 Objectives: Handover is a fundamental component of clinical practice and is essential to ensure safe patient care. For the maintenance of continuity of care and improvment in quality of care, effective inter-shift information communication is necessary. Any handover error can endanger patient safety. In this descriptive study it was the aim to determine handover effectiveness and the factors that effect it in nursing. Methods: The study was conducted with 222 nurses working in a public hospital and at different units in Istanbul between January and March 2017. Descriptive information form and Handover Evaluation Scale were used to collect the data of the study. The data were analyzed by using IBM SPSS Statistics 22.0 statistical software. Approvals from participants, managers of institutions, and ethics committees were obtained for the study. Results: As a result of the research, it was found that the effectiveness of the nurses" handover was above the median value, and the highest score was in the "quality of information" sub-dimension. According to personal and occupational characteristics, there was a statistically significant difference only in terms of gender with the nursing handover efficiency of nurses (p<0.05).